The California Lemon Law is very different that most other state Lemon Laws in that the California Lemon Law applies to all consumer goods that are purchased or used primarily for person, family or household purposes. Most other state Lemon Laws apply only to motor vehicles. So the California Lemon Law applies not only to cars, truck, and vans but also to refrigerators, washers, dryers, dish washers, televisions, coffee makers, air planes, hair dryers, and any other consumer good. 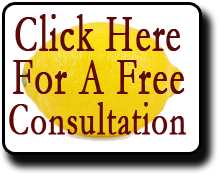 If you believe you have a lemon product, please contact the Law Offices of David J. Farrell and we would be happy to provide you with a free consultation.